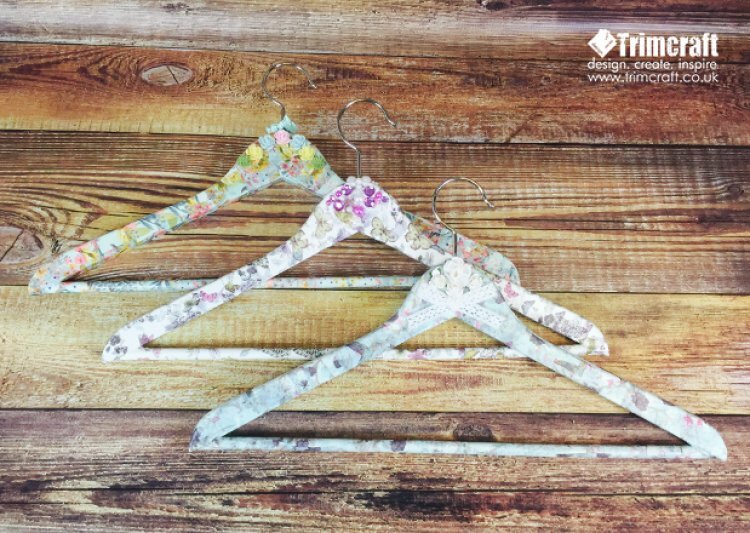 See how easy it is to transform your coat hangers, to give them a new lease of life & turn your wardrobe from drab to fab! 1. Make sure your coat hangers are clean and dry before painting a layer of First Edition Deco Maché Matt Adhesive Glue. Tip: Deco Mache papers will show up better on lighter colours, paint your hangers white before adding your papers to really make the designs stand out! 2. Tear a piece of your chosen deco maché paper and place around your coat hanger. To seal the decoupage, give your paper a top coat of glue. Continue to cover your coat hanger, slightly overlapping each piece of deco maché paper. We have used the First Edition Multi Butterflies Pastels, Humming Bird and Bright Bouquet decoupage papers to cover our coat hangers. 3. To embellish your hangers we have used Dovecraft Resin Flowers to create a stylish feature at the top of the hanger then placed two mini ribbon bows on the metal hook for extra charm, one to the front and one on the back. 4. You can also decorate your hanger with lace; we have made a large bow to fit in the space at the top of the hanger. Make sure your bow is placed central on the hanger before sticking down with double sided tape. We have then placed a large white paper flower at the top of the wooden hanger and added three smaller ones below the larger flower. 5. For an alternative design, you can embellish the top of your hanger with a mixture of adhesive gems and pearls to create a pretty design. Fill as much space as possible by sticking adhesive pearls around the metal hook. Know someone getting married? These would make great keepsakes for the bride and bridesmaids dresses; just add a cute name tag to personalise. We would love to see your embellished hangers in the project gallery!